The New York Times profiles Aledade, started by former National Coordinator Farzad Mostashari, MD, ScM. The piece calls Aledade a tech startup (it has raised $75 million in investor funding), which seems incorrect since technology is just a tiny part of its ACO program to improve healthcare quality and reduced cost via its primary care doctor participants. The profile was run in the Technology section of the paper. Aledade gets paid only if it saves Medicare money, which didn’t happen in 2016. Second-year results are due in October and Mostashari says he expects the company to generate revenue then. From At Last an Alias: “Re: Baylor Scott & White. Replacing Allscripts with Epic starting in October, estimated to take 18 months. I think this just refers to the 10 owned facilities. The North Texas ambulatory practices (aka Health Texas Provider Network) converted from Centricity to Epic in October 2016.” Unverified. From Sweet Ride: “Re: FHIR. Older health standards are published as PDF or text documents, but FHIR has developed a new format for sharing specs that has the same look, feel, and functionality as the FHIR Standard for Trial Use, which they believe will be preferable to their developer audience. Our organization is trying to decide if we should move fast or slow to this format for our FHIR specs given that most hospitals and vendors aren’t used to FHIR yet and may prefer PDFs. Any chance you could run a survey to get input from your readership?” I set up a survey for those willing to help Sweet Ride out. I don’t know anything about it, so maybe we could all stand some enlightening from those who do. From BI Watcher: “Re: Cerner PowerInsight. Did they quietly discontinue it? I’m looking at the latest KLAS analytics report and there’s no mention of it. It was listed last year, albeit with dismal scores.” I don’t know, but I bet someone who does will respond. Blain Newton of HIMSS Analytics is providing great information on EHR vendor footprints, which I appreciate. Here’s his latest, responding to an HIStalk reader who wondered about total inpatient beds served by vendor (click to enlarge). The dominance of Epic and Cerner is obvious. Here’s a view comparing 2012 market share by bed count vs. that of 2016. Meditech and Allscripts each lost 15 percent of their bed coverage over those years as hospital EHR uptake was booming, while McKesson customers stampeded for the door (and into the arms of Cerner and Epic) as the company lost nearly half of the beds it was covering in 2012. Both Cerner and Epic gained a lot of business, but Epic jumped most significantly (120 percent) to lead the pack. 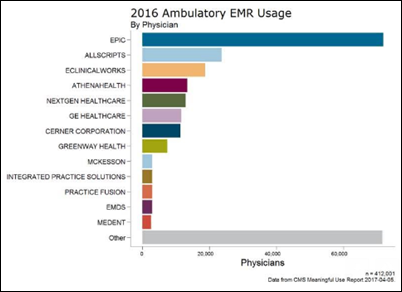 This last graph shows the utter dominance of Epic in terms of physicians using its ambulatory EHR and the dismal failure of Cerner to make a respectable showing. 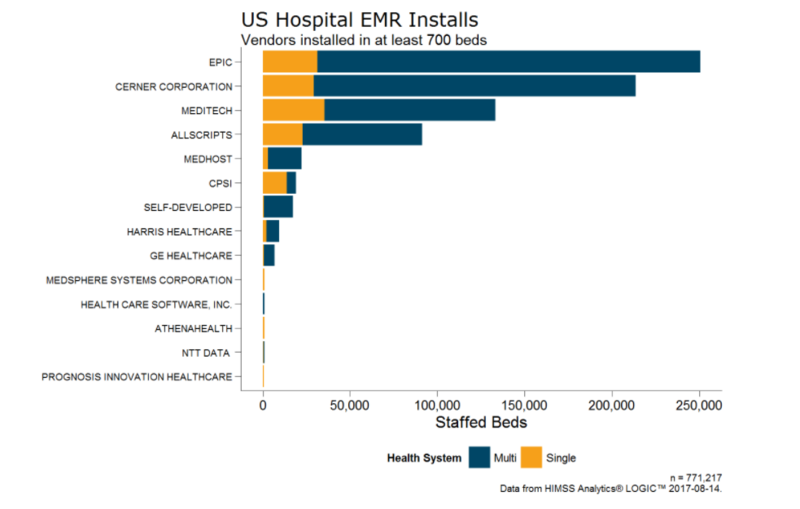 I’ve also asked Blain if he can identify the fastest-growing large health systems/chains and which system they use corporately (which would foretell vendor footprint gains for doing nothing but watching their customers grow). It would also be really interesting to add up the total revenue of each vendor’s customer base as an even better indicator of customer footprint, but that sounds like a daunting project. Fascinating stuff. It’s pretty cool that Blain is willing to share this information given that HIMSS Analytics is in the business of selling rather than gifting it. I certainly appreciate it. Now is the time to start steering toward actionable information for the sake of clinicians and, even more important, the patients that IT, administrators, executives and caregivers all serve. The barriers to EHR implementation and interoperability are slowly coming down and once they do, vendors will start looking to add more functionalities to the systems. Improved healthcare interoperability is a top priority for providers, policymakers, and patients in 2017. Getting a footing in the health IT industry is more challenging than it looks. Care coordination between healthcare settings can have a significant impact on patient care. This week on HIStalk Practice: Amazing Charts decides to sunset InLight. 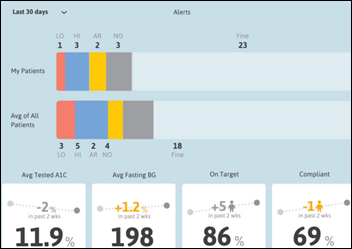 AdvancedMD develops physician reputation management tool. 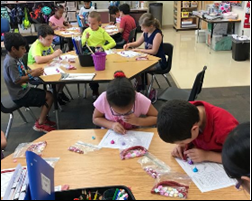 HHS celebrates National Health Center Week with grants to centers across the country. 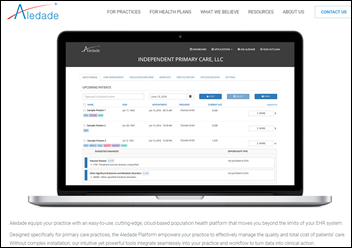 Aledade partners with local PCPs to launch New Jersey ACO. DuPage Medical Group welcomes $1.45 billion investment. UnitedHealthcare helps fund telemedicine services at Kansas FQHC. 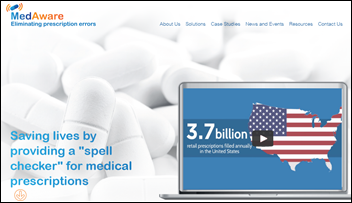 Prescription management and delivery service company Phil raises $10 million. New Jersey Academy of Family Physicians President believesphysicians are shouldering too much of the opioid epidemic blame. AMA President David Barbe, MD shares his frustration with home state of Missouri’s PDMP efforts. Listening: Ayreon, progressive metal rock opera from a Netherlands-based virtuoso who “casts” singers to portray “characters” that perform only in studio since the “band” never appears on stage. With one exception: they’re playing their first-ever actual concerts September 15-17 in the Netherlands featuring 16 singers, including the incomparable Floor Jansen of After Forever and Nightwish. Vince and Frank put their usual expert and brutally honest spin on “Allscripts’ ‘Repeal and Replace’ of McKesson’s EIS” in Thursday’s webinar. We had a bunch of people watching live and the boys answered their questions at the end, guaranteeing that your one hour of watching the YouTube video will be well spent. I tuned in for a quick look and ended up hooked into watching the entire presentations. Israel-based Medaware, whose technology warns a physician when their drug order appears to deviate from the normal prescribing patterns of similar patients, raises $8 million in Series A funding, increasing its total to $12 million. Revenue cycle technology vendor ESolutions acquires RemitData, which offers comparative analytics. Forbes names Salesforce as the world’s most innovative company for 2017. EpiPen maker Mylan will pay $465 million to resolve False Claims Act charges that the company intentionally misclassified the drug product as a generic drug to avoid paying rebates to Medicaid. 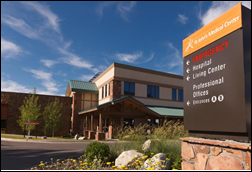 St. John’s Medical Center (WY) chooses Cerner Millennium CommunityWorks, explaining that it “began seeking an alternative EHR vendor when industry events called into question the hospital’s ability to ensure that support from the vendor would continue to be available.” I believe they are (soon to be were) a McKesson (soon to be Allscripts) Paragon user. 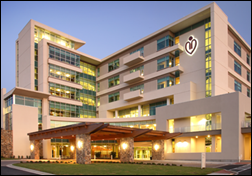 Gwinnett Medical Center (GA) chooses ROI Healthcare Solutions to provide around-the-clock support for its legacy systems during its new EHR implementation. The Strategic Health Information Exchange Collaborative names Kelly Thompson (Pennsylvania Department of Health) as CEO. Verisys hires Joe Montler (McKesson) as SVP of sales. Glytec earns its fourth FDA clearance for components to Glucommander, the core of its patented EGlycemic Management System: a titration module for enteral nutrition patients, an insulin-to-carb ration titration for outpatients, a more streamlined transition of inpatients from intravenous to subcutaneous insulin therapy, and general enhancements to the user interface, workflow capabilities, and messaging. Allscripts will offer its EHR users access to clinical trials via integration with the trials recruitment system of Elligo Health Research. 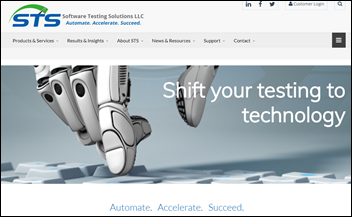 Sunquest Information Systems will resell automated laboratory testing software from Software Testing Solutions. A St. Louis podiatrist who owns a company that services nursing homes is sentenced to 90 months in prison and ordered to repay $7 million for creating an EHR that automatically logged diseases and symptoms the patients didn’t have and for pressuring his employed podiatrists to provide unneeded services. His attorney wife is already in prison for the same conspiracy and the company’s CEO and four of its podiatrists are awaiting sentencing. A 31-year-old restaurant owner is charged with assault after a cardiology clinic’s front desk employee told him his test wasn’t covered by insurance, after which he grabbed her computer monitor (luckily, it was a flat panel) and threw it at her. 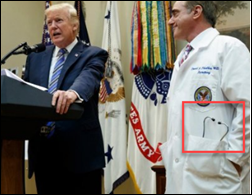 I was amused by this newswire photo, which suggests that VA Secretary David Shulkin, MD rushed right over from hospital rounds to appear in a White House photo op, stethoscope poking conspicuously from his pocket. I have to laugh when doctors who clearly have no use for a stethoscope – such as administrators, psychiatrists, and dermatologists – still drape one over their shoulders or hang it prominently from their pocket to make sure everybody reflexively genuflects. At least Shulkin is an internist and still sees patients, according to some reports. 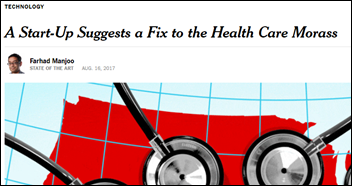 My early experience in rural community hospitals was that the biggest quacks we had on staff – mostly foreign medical graduates back then when standards were low and they didn’t even have to take US boards – were likely to strut around in stiffly starched, name-embroidered lab coats adorned with stethoscopes, perhaps for convenience in pronouncing dead the patients they were mismanaging with a stunning mix of incompetence and arrogance. Medecision Chief Marketing Officer Ellen Dalton will speak at a Technology Association of Georgia Marketing roundtable September 6 in Atlanta. Meditech and Parallon Technology Solutions will exhibit at the HIMSS Summit of the Southeast August 23-24 in Nashville. Optimum Healthcare IT interviews Jon Morris, former SVP/CIO of WellStar Health System. 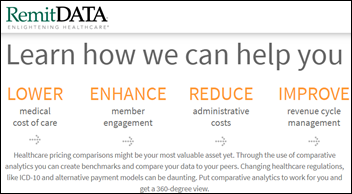 Imprivata joins the CommonWell Health Alliance. NTT Data begins accepting applications for its global Open Innovation Contest. Nvoq will exhibit at Aprima’s annual users conference August 18-20 in Dallas. Clinical Computer System, developer of the Obix Perinatal Data System, will exhibit at the Indiana AWHONN State Conference August 25 in Plainfield. Uniphy Health appoints Ken Fishbain (Cardiothoracic & Vascular Surgical Associates) to its health advisory board. Mr. H, as you said “HIMSS Analytics is in the business of selling rather than gifting”. This leads me to believe that there may be a profit motive for them providing this data. Is it possible that Epic’s non-marketing department asked them to provide the data in slices that showed Epic in the most positive light? Anything is possible, but I trust their data and the information they provided (by bed, historical vs. current, etc.) was exactly what I asked for. I think they would be called out by their other vendor customers if they provided only Epic-friendly information. The biggest surprise wasn’t Epic’s dominance but rather the significant slide in McKesson, Meditech, and Allscripts during that last MU-fueled gold rush, arguably the last opportunity to grab market share without butting heads with the well-provisioned armies of Cerner and Epic. Momentum is powerful. Does the HIMSS analytics include McKesson in the Allscripts number? Or did McKesson fall of that chart in 4 years? I think the first graph I ran (vendors by beds) rolled up McKesson’s numbers under Allscripts. Med-a-ware(Israel) , Med-i-ware(US) …got to be a lawsuit in the works! Isn’t Epic already installed at this organization? 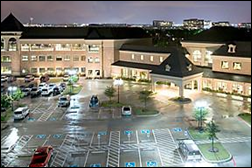 EPIC is installed in the Central Region (Temple/ Scott & White) and with the Physician Network in the Dallas area. The Baylor Health System currently deploys Allscripts. It is Epic not EPIC. 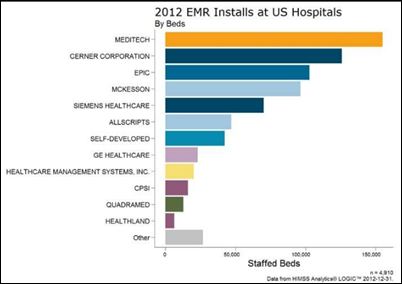 First off, thx to HIMSS Analytics for the chart/data share – aligns closely with our own research. What these charts show is the shear brilliance of Epic to realize that success required an competent EHR for acute AND ambulatory. All the other EHR vendors failed to see this until too late. Epic also has a well respected RCM solution, which competitors also failed to match. Like all vendors, Epic has it warts as well, but those warts e.g. Interop were something customers weren’t asking for anyway. As to Aledade – you’re correct Tim, it really is a services play enabled by tech and not a tech start up venture. 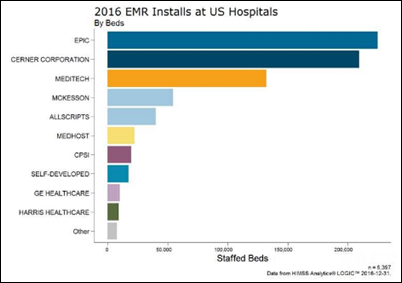 Looking at the EHR usage in the ambulatory space – I dont understand how eCW and athena claim the install bases that they do. eCW on their website says 125K providers and NPs. And here it seems around 20K. Do they really have 5 NPs for every 1 physician. athena recently made a claim of 99K providers to me as well and here they seem to be in the 15K range. athena’s provider counts are audited as part of its SEC filings. The discrepancy between the ~99K number and what you see here is a comparison of the athena revenue cycle product provider count (about 100k) and the EHR product provider count (something in the low 20K range). That is not true. Just because Athena or any company puts secondary metrics in SEC filings does NOT mean they are audited. They are not. The only thing audited are the financial statements. Very important to be clear on that. This does not mean the numbers are wrong but big difference. This goes for bookings and other figures. That said, making a claim in any communication including an SEC filing if it is found to be incorrect later can be problematic from a litigation or securities fraud standpoint.